The 2015/16 premiership season has hit half time and what a season it has been so far. The Special one is now the unemployed one, Klopp is vying to be King of the Kop and Big Sam is trying to pull off the biggest magic trick in football. Who will win the title? Who has the best football club tie? Here is a run down of the club ties and how the teams stand at the half way point . Arsenal like to be slick off the pitch as much as they are on the pitch and it’s the same with their simple but effective club ties. That is why they are leading at this point in the season. This Arsenal club tie is 100% polyester and perfectly complements the Arsenal home kit. Arsenal currently sit top of the table two points clear of Leicester and if they can stay off injury, they have a good chance of lifting the Premier League trophy come end of the season. He’s scored 12 goals so far this season and Olivier Giroud is aiming to stay Arsenal’s top goal scorer for the season. Leicester City who only just stayed up last season due to an impressive finish have a simple but effective blue, white and light blue 100% polyester club tie. According to the bookies the East Midland’s club were second favourites to be relegated to the Championship, but with them holding second position in the League, they have proven the bookies wrong. The Foxes are the surprise team this season. They have beaten the likes of Chelsea and Manchester United and currently lie in second place. If Vardy and Riyad Mahrez keep up their form, who knows what could happen. Jamie Vardy is the top scorer for Leicester City with 15 goals scored this season. This silk blue striped club tie features the Manchester City club crest on the bottom left corner of the tie. After spending £47million on Raheem Sterling the blues were hoping to challenge Chelsea for the Premiership title this season, but have instead surpassed their rivals to hold third place. City are the bookies favourite to finish top of the Premier League come end of the season. However with City yet to win the Champions League its hard to tell were their priorities lie. For Manchester City, Sergio Aguero is the top scorer for this season with 8 goals. Tottenham Hotspur’s official cub tie is designed with the blue and white of the famous London club and the club’s cockerel crest proudly sits at the bottom of the tie. With Harry Kane’s eleven goals Spurs have managed to climb to fourth in the table and with United’s and Chelsea’s poor form they will hope to finish there at the end of the season. This Manchester United club tie is 100% polyester and features the world famous club crest woven into the bottom left of the tie. The Red Devil’s hope to challenge for the league title this season after a number of big signings such as Memphis Depay and Bastian Schweinsteiger. It’s been difficult season so far for Louis Van Gal with his style of Football being labelled as boring by a number of high level pundits. They definitely need to improve and score more goals to finish in a Champions League position. With eleven goals this season, Wayne Rooney is Man United’s lead scorer..
West Ham United’s club tie is a crisp light blue which is, ready to stand out when worn by fans this season. The crest of the club represents the history of the Irons and sits on the left of the tip. Slaven Bilic has definitely improved West Ham this season guiding them to 6th in the League. They will hope to finish in an Europa League this season so they can bring European football to Olympic stadium next year. Dimitri Payet has struck 6 goals into the back of the net this season to be West Ham United’s lead scorer. Made from a 100% silk the Crystal Palace club tie features the club’s iconic eagle badge. Palace finished 10th last season and were hope to do even better this time round and they appear to be succeeding … the Eagles souring around Europe anybody? With the help of summer signing Yohan Cayabe, who has become their lead goal scorer, Crystal Palace have impressed under Alan Pardew and have climbed to an impressive 7th. If they keep up this current form they could easily challenge for an Europa League Place. There aren’t many clubs with as rich a domestic history as Liverpool … maybe one, or maybe two perhaps? But red is obviously a champion’s colour and this polyester club tie features the Liverpool’s famous Liver Bird logo at the bottom right. Liverpool hope to finish in the top four after the big summer signings of Christian Benteke and Nathaniel Clyne. Benteke has taken the position as Liverpool’s lead scorer as well with six goals. With the sacking of Brendan Rodgers in October the Reds appointed Jurgen Klopp. However they have struggled to find form due to injuries and currently sit eighth in the table. The Watford club tie is a proud black with gold stripes and the Watford ‘stag’ logo sitting at the bottom left hand side of the tie. The Hornets were promoted from the Championship last season and are desperately trying to secure their Premiership future. Watford are another surprise team this season especially when they were one of the favourites to go down. However Quique Sánchez Flores has got them playing impressive football and got them in the top half. Troy Deeney has scored 6 goals this season to take the role as Watford’s top scorer. The Stoke City club tie is a strong red with a dotted pattern. Made from 100% polyester, this tie will be perfect for celebrating another year staying in the Premiership under Mark Hughes. Mark Hughes has really changed Stoke’s image from a long ball team to a team that plays good football so far this season and new signings such as Bojan and Arnautovic have helped them climb to tenth in the table and touching distance from Europe. Marko Arnautovic takes pole position as Stoke City’s top goal scorer with seven goals. This silk club tie in the classic Everton blue, matches the toffee’s iconic home kit which has been around since the 1900s. Roberto Martinez’s side had a difficult season last term and hope to improve on their 11th place finish. Everton have a had steady first half of the season however it could have been better. But with striker, Lukaku on form they could easily climb up the table. Lukaku is the lead goal scorer of the season along with Jamie Vardy with 15 goals. The official club tie of West Bromwich Albion is a solid navy blue with the Baggie’s club logo standing proudly at the tip. It’s been a steady season so far for the Baggies who have improved under Tony Pulis and currently sit in a comfortable 12th. Berahino has scored 4 goals for West Brom this season as well as Morrison making them joint leading goal scorers. Southampton were the surprise team last season finishing in the top half of the Premier League under new manager Ronald Koeman. The Saints official club tie is 100% polyester tie and bears the club’s iconic badge and colours, which they have played in since 1896. Compared to last season Southampton will be disappointed with their current league position and will hope to improve in the second half. Graziano Pelle is the lead goal scorer for Southampton with 6 goals. The club tie of the current Premier League Champions has a striped design with black, blue and white colours. Its a club tie that every fan of the current Champions should wear. Chelsea have probably been the shock of the season who seemed to implode under Jose Mourinho. He was eventually sacked and replaced by Guus Hiddink who has steadied the ship. Diego Costa is trying to pull Chelsea up 6 goals this season becoming their top scorer. The Norwich City official club tie is black and green with the canary in silver at the tip of the tie. The Norfolk club are currently evens at most bookmakers to be relegated, so it could be a tough season for the team recently promoted from the Championship. The Canaries are doing as well as they were expected to do so far this season and will hopefully avoid the drop into championship. Howson and Redmond have both scored 4 goals each making them joint lead goal scorer so far this season. The newly promoted team are currently 16th in the League and are hoping to improve their position in the second half of the season. Their club tie is a black tie with shadowed logo with one main club logo in the centre at the tip of the tie. Unfortunately Bournemouth have struggled with injuries which has effected their season and they currently sit three points above the drop zone. Murray is leading his team as goal scorer with 5 goals. Swansea City’s club tie is a solid black with white and red stripes with the famous white swan crest at the bottom corner of the tie. Swansea City have also been team that surprised us with their poor form and things haven’t got better for the swans with them being knocked out of the FA Cup by League 2 side, Oxford United. Andre Ayew is smashing the goals in this season as the lead goal scorer for Swansea with 7 goals. The official club tie for Newcastle Untied is made from 100% Polyester and adopts the same classic colours as the Magpies home shirt. Where Newcastle will finish is a bit of a wild card, especially under new manager Steve McLaren. It hasn’t been a good first half of the season for the Newcastle and have struggled to pick up results at home and on the road. However there are teams worse than Newcastle in the league meaning they will just escape relegation. Georginio Wijnaldum has scored 8 goals for Newcastle this season making him their lead scorer. 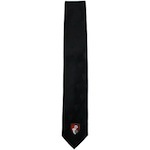 The Sunderland official club tie is red with black and white stripes with the rampant black lion logo stands proudly at the bottom of the tie. Even though they sit 19th in the table, this won’t worry Big Sam. He has improved the teams defence and has them playing the true Big Sam way and in true Sam Allardyce fashion they will probably stay up. Jermain Defoe have been smashing the goals in for Sunderland this year with a total of 9 goals so far. The Villa club tie, which has the club badge in the corner, adopts the same style as the club’s home kit and is made from 100% polyester. Aston Villa have probably been the most disappointing team so far this season and they currently prop up the Premier League table. If they don’t improve quick they will definitely be relegated to the Championship. Sinclair has leading Aston Villa’s goal scorers with 6 goals. James Morton – the UK’s premier supplier of football club ties.